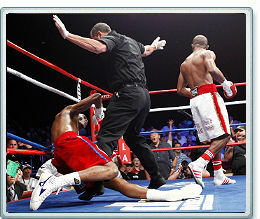 Erislandy Lara got back to winning ways last Friday and he couldn't have done it in better fashion. Lara came up against Ronald Hearns in a semi-final title eliminator for the WBC Light Middleweight title. Lara proved too much for Hearns as he knocked him down three times in 90 seconds with the referee waving off the bout after Hearns's third trip to the canvas. Lara is definitely one to watch. Most spectators felt he easily beat Paul Williams last year, and with his knock-out victory over Ronald Hearns he proves he has power to go with his slick boxing skills.